Last night I sat with a group of St Etienne supporters for dinner in the gite La Cabourne in Saint Privat d’Allier. I felt like a two year old sitting quietly and saying the occasional word to much encouragement. Dinner started well with a delicious lentil salad but the main course was a dish of pork fat and tripe sausages with potatoes roasted in the fat. Well received by the locals but I side stepped that one! However an epic cheese board followed with local cheeses and plenty of the local red wine. And then chocolate gateaux. I woke this morning to the dramatic news from AccuWeather that “Rain will start in 17 minutes”. So after the time honoured breakfast of bread, unsalted butter and apricot jam, “I” and me put on the rain gear and departed Saint Privat d’Allier bound for Saugues. It rained just about the whole day until we arrived in Saugues when the sun came out. We passed two French women in the forest breaking fallen branches into a walking stick and exchanged a “Bonjour”. 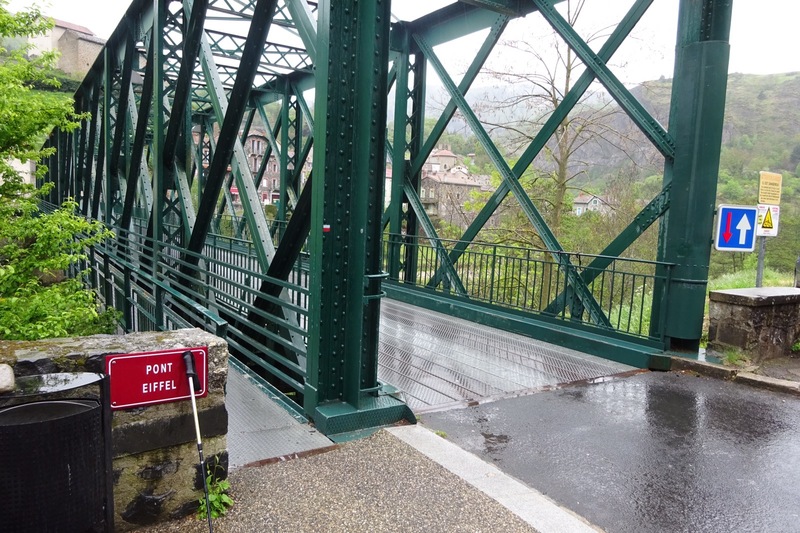 A little later we reached the village of Monistrol and crossed the impressive Eiffel Bridge over the Allier River. The village was once a thriving mill town but is now almost abandoned save for a charming tea room. Perfect timing for a green tea and the gateaux du jour. The French ladies joined us in the tearoom after a while with their new sticks for their Camino. They had only just met each other in the Cathedral of Le Puy during yesterday’s Mass and two more different people you couldn’t imagine. 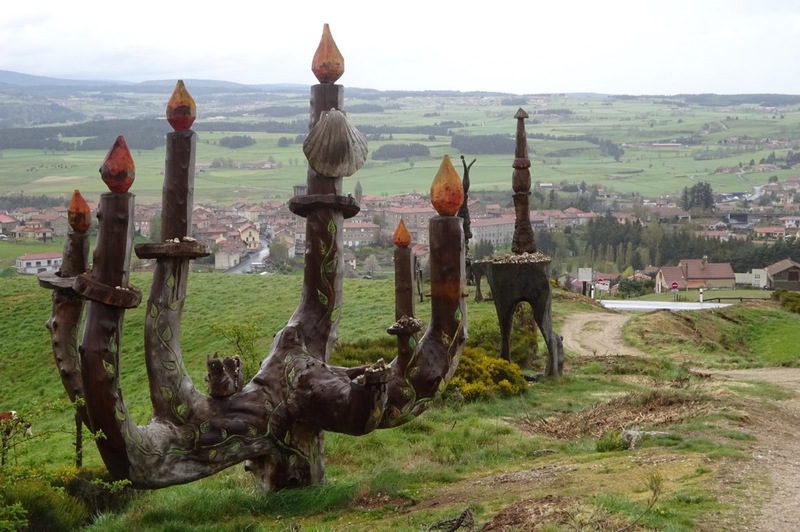 It is a constant reminder that the Camino welcomes everyone. One of these ladies was fluent in English, having studied law in America and worked for an American law firm before being transferred to London 15 years ago. Married to a French man who heads up the European office of a US cable firm, she has a 17 year old daughter from a previous marriage, a 7 year old and 5 year old twins. The household in Hampstead includes a Spanish nanny and an 18 year old au pair. French is the official language at home but the children speak English to each other and Spanish to the nanny. However the nanny is returning to Barcelona and will be replaced by an English girl who will be better able to supervise homework. In the midst of this turmoil, Mum is starting her Camino, walking 2 weeks every year while her husband has to cope with everybody back home. I’m sure he’ll be exhausted by the time she’s back. While the lawyer has booked single rooms in the best available accommodation, the other lady is camping where she can. She is carrying her tent and all the camping paraphernalia as she walks the Camino. I have seen several French films of girls roaming the wilds of France in this fashion so perhaps it is quite common. We left them with their clothes steaming in front of the fire in the tearoom and set off to climb the Margeride mountains. Before long we caught up with the Japanese team, also from yesterday’s Mass. 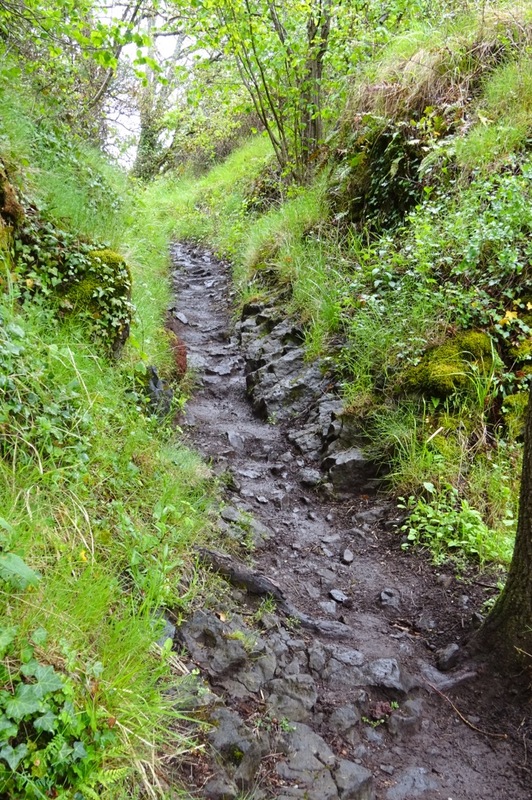 They are walking their 3rd Camino. We duly posed for photographs at the best vistas over the gorge and their leader offered a rough translation of the prayer with which I’ve been entrusted. It is a prayer for a peaceful life at last (my italics, or not. Difficult to tell in Japanese). The wind and the rain was too strong for a nice picnic on the plateau but we found a somewhat sheltered spot under a tree. Unfortunately this turned out to be a nest of ants. 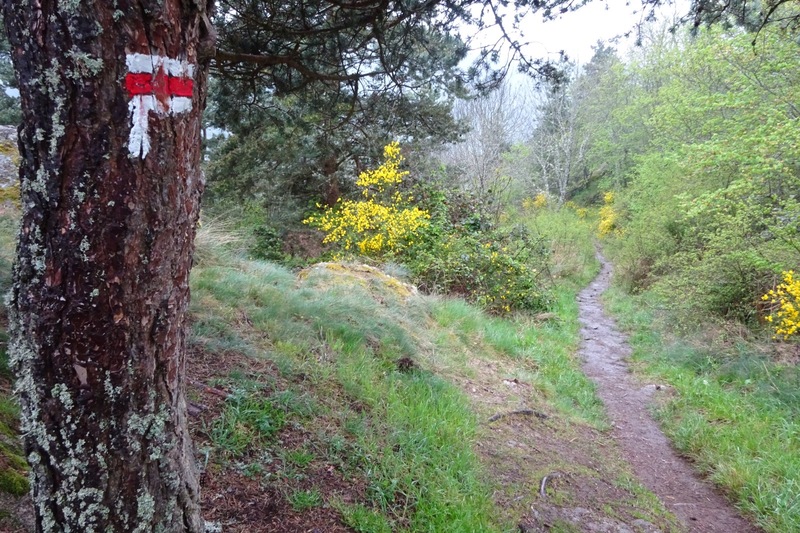 Given the weather and the ants, the picnic was over quickly and we zipped up and turned into the fierce wind and rain for the descent into Saugues. Tonight’s gite (La Margeride in Sauges) costs 33 Euro for dinner, bed and breakfast including wine. That’s about double the price in Spain but still great value. There are several ladies of a certain age at the table saying how their mothers are worried about them walking the Camino alone. 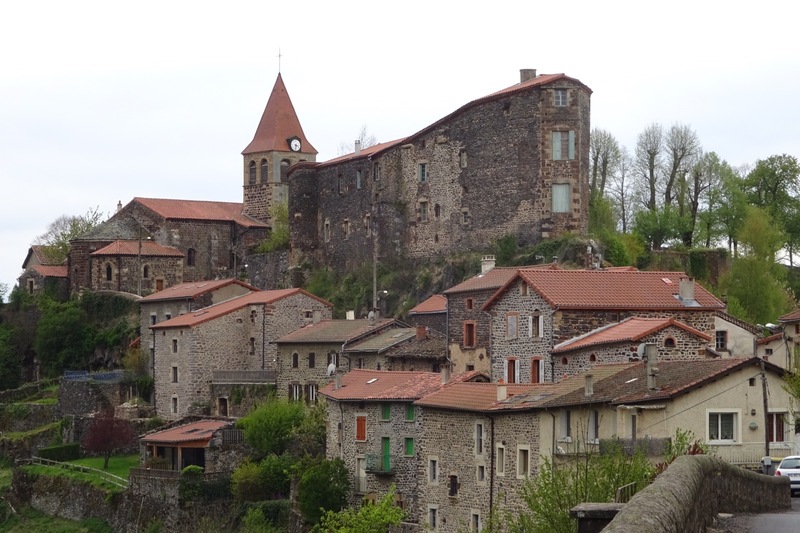 It is not surprising: tomorrow we walk across the region terrorised by the Beast of Gevaudan in the 1760s. 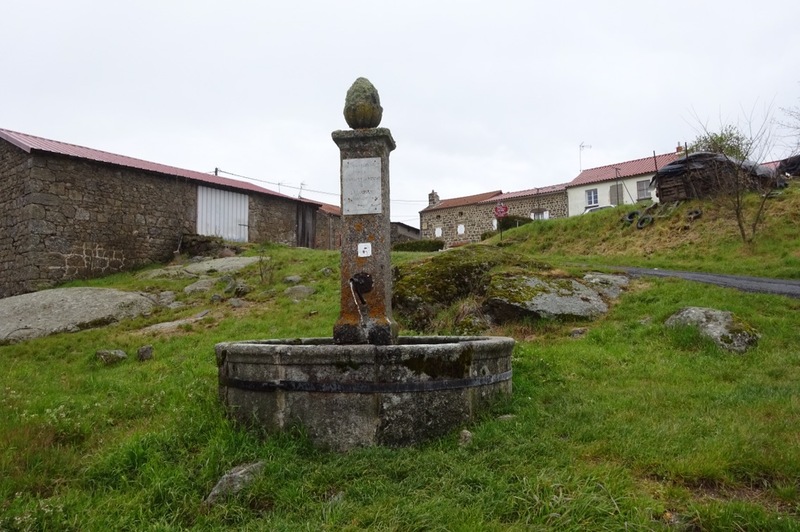 Fountain by a lonely farmhouse on the Margeride plateau. Thank you Mike. Have you checked AccuWeather?